There have been some remarkable changes on Ribbons in Access 2010. The Access 2007 Office Menu has been replaced by BackStage View. Ribbon Group has received new attributes (autoScale, centerVertically). Ribbon controls "comboBox", "dynamicMenu" and "gallery" also received a new attribute (invalidateContentOnDrop). It is now possible to activate a user-defined tab by VBA: gobjRibbon.ActivateTab "idOfMyTab". But the vast majority of changes have been introduced with BackStage View. There are 60 new pages referring to BackStage View on http://www.accessribbon.com. 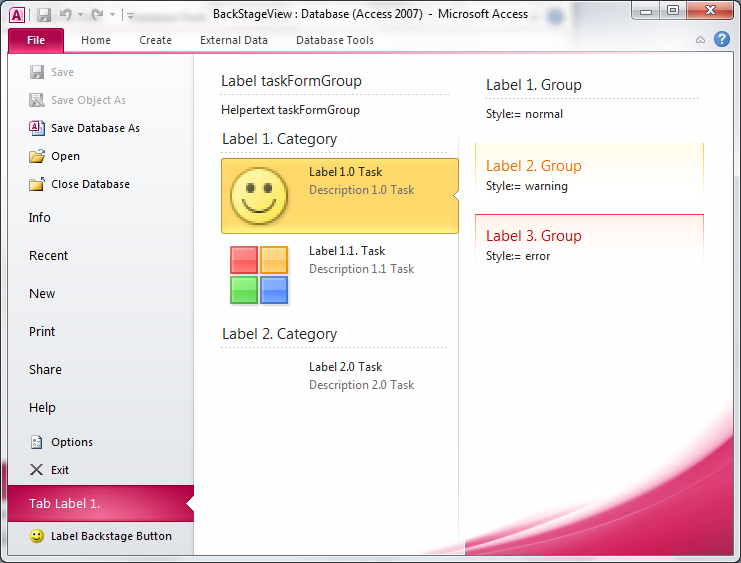 Sample Databases will gradually be updated for Access 2010. For BackStage View there are Sample Downloads available now. BackStage View controls have partially new Callbacks as listed here. New Custom UI Editor for Ribbons in Office 2010 customizing is availible!. Remark: All functions, properties and attributes presented on this page function of Access / Office 2010 only. Enjoy the new opportunities of Access 2010.